Happy first day of Winter! Today I am going to share my top favorite Bath & Body Work winter candles. If you haven't already don't forget to check out my previous posts where I shared my favorite summer candles and the most recent my favorite fall candles. I have a lot more candles to share for my winter edition. I try to limit myself to my top five favorite candles but I just couldn't do it this month. I love all the candles I'm sharing today and you too will see why if you have either smelled it in the past or if you smell it after reading this post. I have a lot of candles to talk about so let just quickly begin. The first candle I want to talk about is the ideal winter or Christmassy candle, at least it is in my opinion. Tis The Season contains the classic cinnamon scent that warms up the entire room that it's burning in. It makes that room feel so warm and cozy with a perfect hint of freshness because of the red apples. I burn this candle every single year and I even finished burning one a few weeks ago. Notes: red apples, sweet cinnamon bark, cedar wood. The following candle contains more of a fresh scent which you know I love. If you love fresh scented candles and ones that smell of clean man Winter is definitely the candle for you. I love the feeling I get when I have these kinds of candles burning especially on a nice cold winter day. The freshness of the candle gives me a refreshing feeling that makes me want to wrap a cozy blanket around me. Notes: pine needles, white woods, sparkling clementine, spiced cloves. This next candle is an essential of mine, an all time favorite. Peppermint is one of Christmas' signature scent so it only made sense to include Twisted Peppermint in this post. When I was a kid, I'm sure like most kids, I was obsessed with candy canes. As I grew up I wasn't as fond of them as I once was but the scent was always a favorite of mine. I guess the scent kind of makes me nostalgic in a way because it brings back wonderful memories of Christmas while I was a kid. It's filled nothing short of happiness. This candle can became a little overwhelming if I leave it burning for hours on end. This candle is perfect to have burning while you're anxiously waiting for Christmas to arrive. Notes: cool peppermint, sugar snow, vanilla buttercream, fresh balsam, hint of musk. Another all time favorite candle of mine is Winter Candy Apple. I love candles which consist of red apple scent. When I smell this candle I feel a hint of sweet freshness. Winter Candy Apple and even Twisted Peppermint are some candles that I have repurchased countless times. I've even owned this scent in a body wash and hand sanitizers in the past and I just loved them. I don't think the scent is one you'll grow tired of its just perfect. Notes: red apple, candied orange, maple leaf, cinnamon, winter rose petals. I know I just mentioned two of my all time favorite scents and here is one last one. B&BW winter candles are some of my absolute favorite. Another candle I have purchased multiple times and even have a bunch stashed away is Marshmallow Fireside. This candle was one of the first candles of theirs that I fell in love with. Typically I don't gravitate to sweet candles but this one is just perfect. The marshmallow scent is heavenly and you can literally get a hint of the fire burning when you smell the candle. This is one of my favorite candles to burn on a cold afternoon because its one of those candles that gives me such a comforting feeling. Notes: toasted marshmallows, smoldering woods, fire roasted vanilla, crystallized amber. For the last candle that I'm sharing from B&BW is an essential for me to have burning more so once we're closer to Christmas. I love having a candle that smells of Christmas trees or something similar to a wreath. 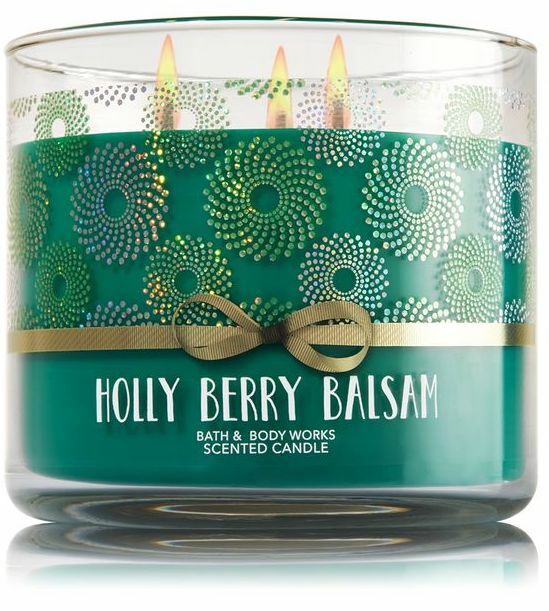 Holly Berry Balsam is one of the newest scents B&BW came out with this year. This candle smells of a few different scents but the most potent is the notes of Christmas tree. This is another candle that gives me such a comforting feel while I have it lit. At my house we have artificial trees so anything to fill up the house of that fir scent I am all for it. This specific candle isn't necessarily a must have of mine but its more of the scent that is. I will take any brand of candle that smells of Christmas tree and this year it so happens to be this one from B&BW which I'm loving. Notes: winter cranberry, snow-kissed citrus, blue spruce, fir balsam. For my last favorite winter candle is of course a Gingerbread scent. A gingerbread candle is an absolute must have of mine during the winter or more so during Christmas. 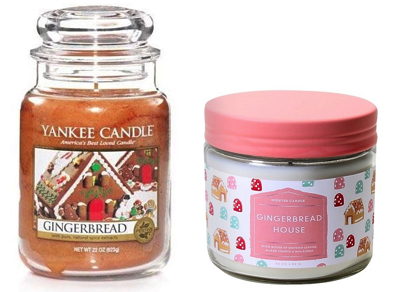 Sadly B&BW's doesn't carry a gingerbread candle that I enjoy, they all have somewhat of a perfume scent that I don't like. It has to be a true gingerbread scent. The first gingerbread candle I ever owned was from Yankee Candle and I swear it was the most delicious scented candle I've ever smelled. I loved this candle so much. I burned it sparingly and it lasted me for years and I'm barely going to finish it this year. Unfortunately Yankee Candles no longer carry this specific candle however I came across this Gingerbread House candle from Target that smells almost if not identical to it. I'm not very picky when it comes to what brand of candles I purchase I don't only stick to B&BW. You should definitely check out the this candle from Target even price is really good for the size. Before I forget lets just take a moment to appreciate the adorable packaging, and yes the lid is peach. They also have a few more candles in this cute packaging all in different scents. I picked up Peppermint Kiss and it is amazing! Notes: ground ginger, bakes cookies, molasses. What are some of your favorite winter candles? Do we have any of the same candles in common? Winter Candy Apple is for sure a favorite! I haven't burn ti's the season long enough to know if I like it but it kind of reminds me of Winter Candy Apple. I wish I was able to buy that YK gingerbread candle. It smelled amazing! I checked the Yankee Candle in Oakridge and they didn't have it there either :( I have so many candles I still want to burn before Christmas and so little time. I haven't even burned Winter Candy Apple this year.